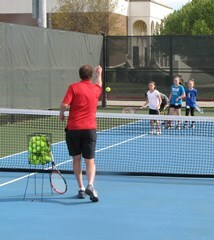 USTPA Tennis Pro, Chris Choate, will be offering a week of beginner tennis lessons. Registration is limited to 12 kids per week session. Tennis lesson will cost $50 per kid per week. Please pay on the first day of the lesson. Register with Chris by cell: 817-769-0349 or email at chrisjchoate@gmail.com. Sign up by May 30th.